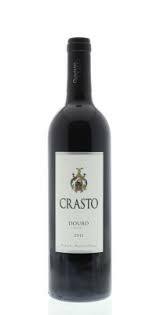 I am not happy with Crasto wine, from the Portuguese Duoro Valley. Someone brought a bottle to one of our parties, as a gift, and I fell in love with it from the first sip. It’s a blend of Spanish/Portuguese grapes I’ve never heard of: Touriga Nacional, Tinta Roriz, Touriga Franca, and Tinta Barroca. The Douro Valley is the Portuguese version of Bordeaux, or Sonoma. They take their wines seriously, and this is no exception to that rule. I hesitate to compare it directly to anything. It’s a red wine, of course. It’s livelier than a Cabernet, not as spicy as a Zinfandel, and nothing at all like a Merlot or a Pinot Noir. It’s a bit like a Garnacha, but fuller, richer. It’s a lovely wine. The problem with it is that I seem to have a mild allergy to the darn thing. Curses! Sigh. Oh well. Another day, another wine….